Given that we have all the python libraries installed (installed from .deb), this section will focus on preparing the development environment on Eclipse IDE. 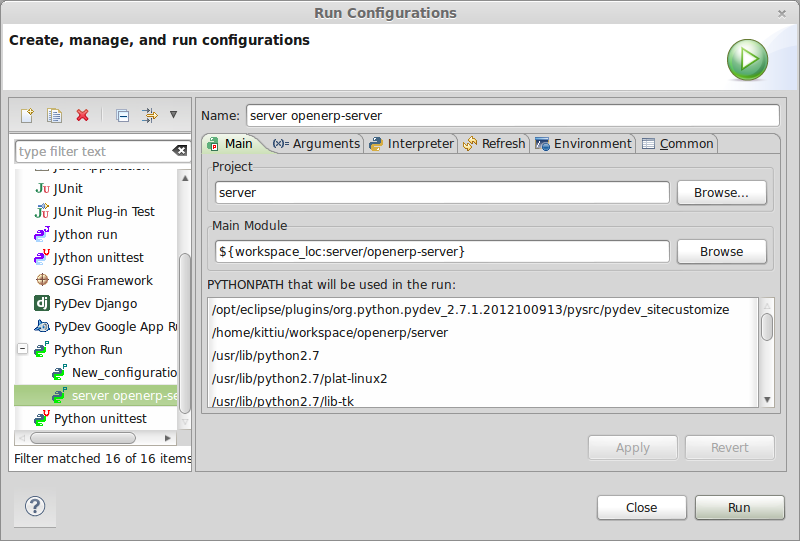 Given that, we can start running OpenERP from Eclipse, and start digging and understand OpenERP under the hood. Lets add a link to the executable – ”/opt/eclipse/eclipse” in /usr/bin for easier access. We can start eclipse now by typing “sudo eclipse” in terminal. But let’s make it a bit more easy to access by adding the Launcher for Eclipse. Add following parameters and save file. 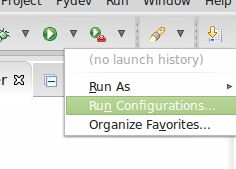 You should now be able to launch Eclipse from the Launcher. As we are doing Python programming, we are going to need the PyDev plugin installed. 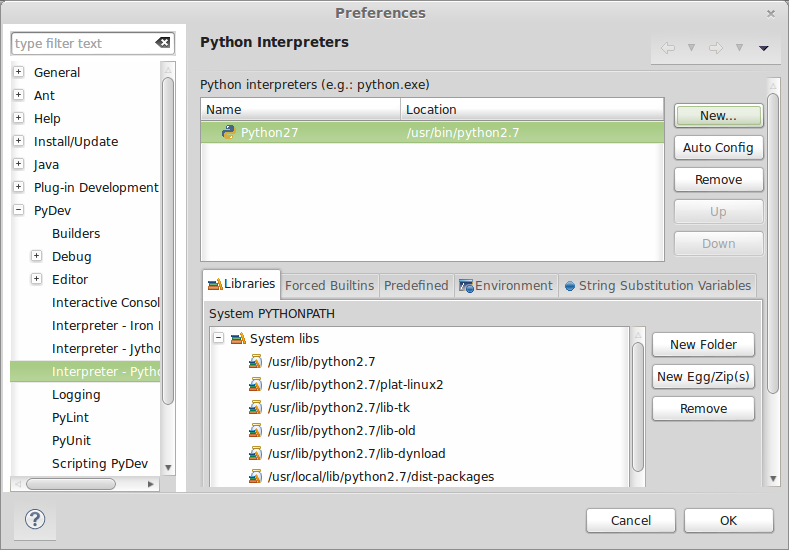 Next step, we need to tell Eclipse / PyDev, where the Python compiler is located. 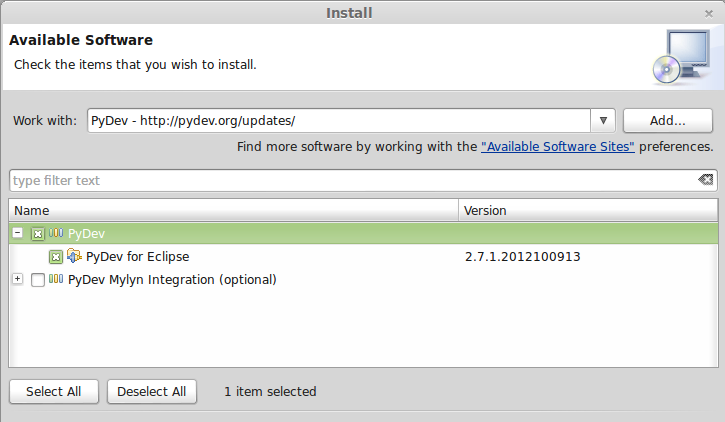 Now, Eclipse should be ready for Python / OpenERP development. Download Latest OpenERP source code from launchpad. In this step, we will be getting the OpenERP 7 source code which consist of 3 folders 1) addons 2) server 3) web. We will then create these source code folder as project in *openerp* workspace we created in the previous step. We will be getting the source code into local repository first. This prove to be more convenient as we could do the cloning anytime without having to go to the OpenERP server every time. OpenERP use launchpad to keep its source code. It need Bzr software to communicate and pull the source code from server. As such, before we proceed to download the code, we will need to install the Bzr first. openerp-server is the executable, and is located in the server project, –config is an optional flag that will point to the configuration file. Running from the Eclipse is also note different. The only thing we will need to create manually is the openerp-server.conf file. Create openerp-server.conf file with following parameters and locate it in the server folder. We are providing some additional parameters,i.e., addons_path is telling location to load addons (modules), log_level = info and port is 7069 (instead of 8069). Go to http://localhost:7069 and start playing with OpenERP!